Holidays always seem to sneak up on me. I’ll think of them well in advance – but then the time flies and next thing I know I’m frantically tossing out decorations ‘the week of’ so that my kids will have some sense of holiday spirit. That’s why I’m taking the time now to honor those that have their act together. Here is a showcase of some of the most clever and inspirational Easter decorations that I’ve stumbled upon this year. 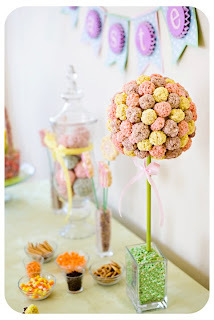 Cute as a Fox Creations created this gorgeous Rice Krispie Treats topiary and gets my vote for the best edible Easter decoration this year. Wow! 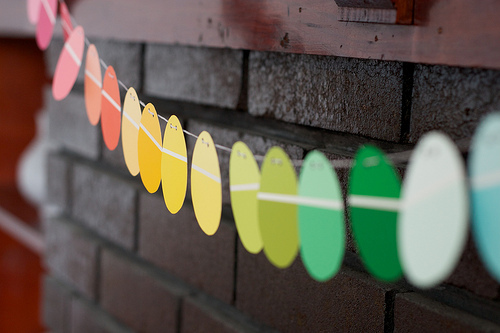 Heather over at The Coterie Blog wins the most effective decoration at low/no cost for her paint chip Easter egg garland. This is the kind of thing that really makes me happy just looking at it. Even though Lucy over at Lucy Designs might not have made this guy specifically as an Easter decoration, he does get my vote for most versatile decoration and can ruffle his feathers at Easter or any other time of the year. A Leopard spotted rooster…brilliant! Best decorated Easter eggs goes to Wunderweib in Germany for their unique mosaic and decoupage blue eggs. 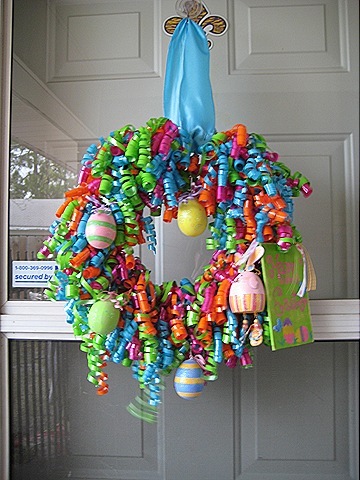 I’m just a sucker for curling ribbon, so I can’t help but adore this most colorful Easter wreath that Christy made for herself over at Embellished Bayou. And it can even be modified for other events like birthday parties! Look at these super cute crocheted eggs over at Lady Crochet. The colors! The cuteness! They get my most tactile Easter decoration award.